Many papers have noted the challenges associated with assigning function to non-coding genetic variation, and since the majority of GWAS hits for common traits are non-coding, resources for providing some mechanism for these associations are desperately needed. Boyle and colleagues have constructed a database called RegulomeDB to provide functional assignments to variants using data from manual curation, CHiP-seq data, chromatin state information, eQTLs across multiple cell lines, and some computational predictions generated from DNase footprinting and transcription factor binding motifs. 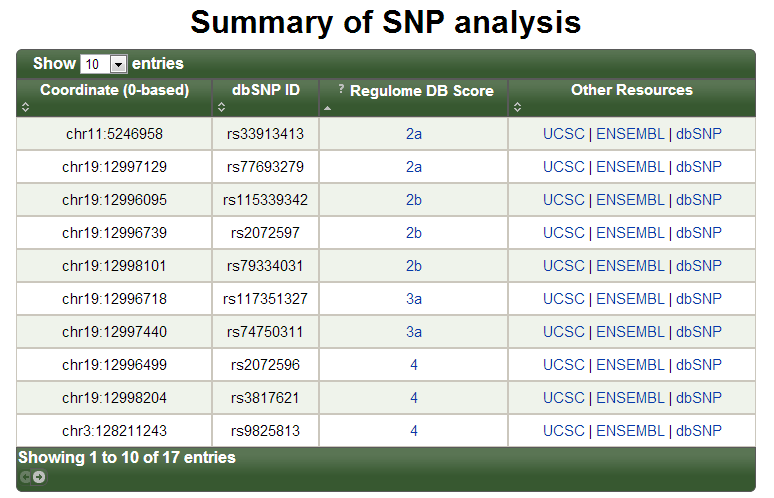 RegulomeDB implements a tiered category system (1-6) where category 1 has an eQTL association in addition to other ENCODE sources of data, 2 -5 have some ENCODE data only with no eQTL associations, and category 6 has evidence of a binding motif change only. As you might imagine, the annotation density increases as you increase category numbers. Their simple, but impressive interface will accept RS numbers, or whole BED, GFF, or VCF files for annotation. 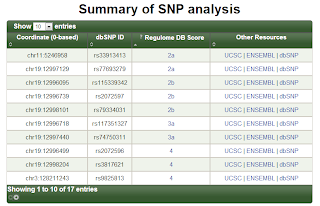 The resulting output (example above) is downloadable, providing both specifics of the annotation (such as the transcription factor binding to the area) and the functional score for the variant.